You can find many widgets for your Mac. To get you started, Apple supplies a collection of basic widgets (calculator, clock, calendar, weather) for your Mac. Thousands of interesting widgets are available online at Apple’s Web site. Better yet, the great majority of downloadable widgets are gratis. A few are available as shareware, meaning you can try them out before paying. Some widgets are extensions to other programs on your computer, such as the ones that display data from iCal or your Address Book or bring up blank Stickies. But most widgets grab feeds off the Internet, so you need an online connection. Widgets in this category might tell you what’s on the TV tonight, for example. If you hold down the Shift key while you press F12, the widgets will open or close in super-slow-motion. If you hover over an open widget and press Command+R, the wizard refreshes itself. Any “live” information will be updated. You can clip portions of a Web page using the Safari browser and turn it into a widget. If you’re a MobileMe account holder, you can sync the Dashboard from one Mac to another. You can even get a widget to manage all your other widgets. 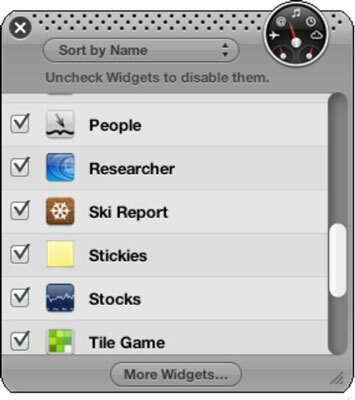 The widget shown in this figure contains a list of other widgets (People, Researcher, Ski Report, and so on). By unchecking the names of the widgets in the list, you can disable them and, in some cases, send them to the trash. If you click the More Widgets button, you’ll be transported to Apple’s main Dashboard Widgets Web page, where you can download other widgets.